As an eco-art project, DEHSART is an exploration of science, engineering, art, and design that informs transdisciplinary action for tackling ecological issues and reveals an experimental curatorial approach with methodologies that embrace recycling, reuse, repurposing and creative strategies combined with disciplines of cultural anthropology, economics, sociology, archaeology, geography, history, and environmental studies. 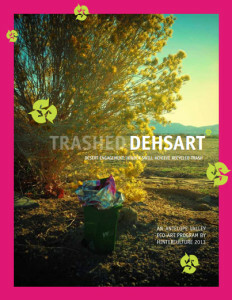 DEHSART asks many questions about waste, viewing it not just as an environmental problem, but as a process and a convergence of humans and nature, of rejected material cultural, social value judgments, infrastructural and economic challenges, and most potently–as a source of creativity. Read the DEHSART evaluation and progress document here.